Ok, let’s start with the obvious. Rankings definitely matter. If rankings didn’t matter, I wouldn’t have a job. What may be less obvious, is that ranking #1 doesn’t matter. At least, it doesn’t matter nearly as much as it used to. In the world of digital marketing, ranking number 1 should never be your ultimate goal. Your business can be seriously mislead by tracking and focusing on rankings. Take a step back for a second and look at the bigger picture. Not only are there better business metrics, but search engine result pages (SERP) look a lot different than they used to. Even if you optimize well enough to rank #1 organically, you may be pushed half way down the SERP. Google recently added a 4th paid search result to the top of the page, taking up highly valuable real estate. Next, the map pack shows local firms in the immediate area. Finally, after all that, you get to organic position #1. In this example, the user would have to ignore a total of 14 links before getting to Avvo, a legal directory. 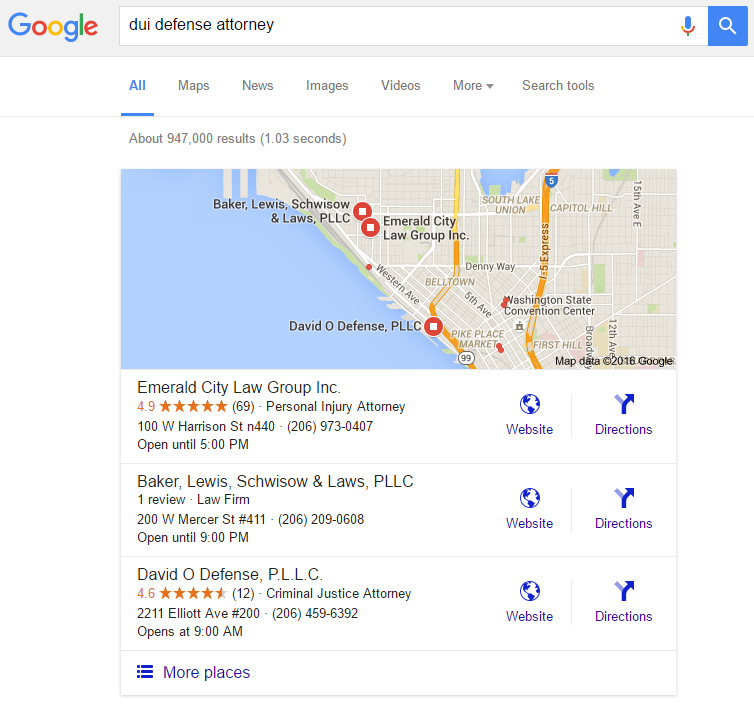 Notice, after all these links, we still don’t see a law firm in the true organic section of Google. Make sure you don’t get caught focusing on this very low #1 position. There are other areas of the SERP that can help you generate leads. 2) User Location Changes Everything! Search results change dramatically based on a user’s physical location. This is one of the largest hurdles to tracking rankings effectively – your law firm could rank #1 and #7 simultaneously for the same search phrase. 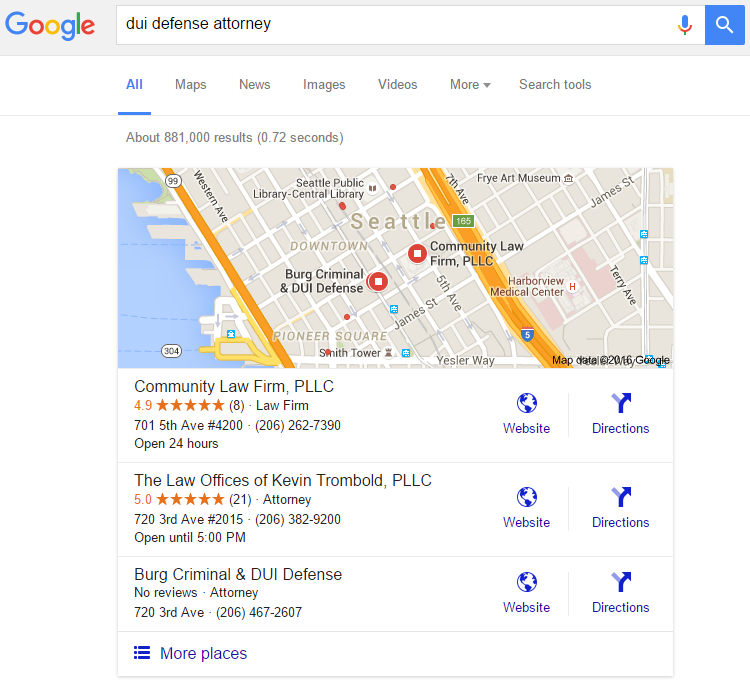 Take for example, a user who searches for “DUI Defense Attorney” while in downtown Seattle. If they move just a mile north, that same user (with the same search phrase) is presented an entirely different set of results! No single firm truly “ranks #1” for this search phrase. Don’t waste your time trying to track this. 3) Legal Answers in the Knowledge Box. 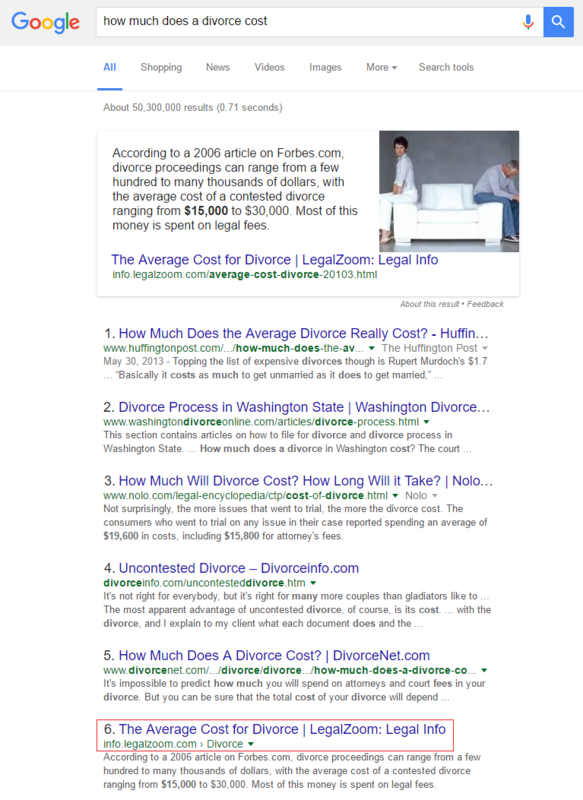 Who is winning for the search phrase “how much does a divorce cost?” Is it HuffingtonPost sitting at organic position #1? Nope. The real winner here is LegalZoom, technically ranking #6. Google has recognized the information on their site provides the best answer to this question and rewarded them with a spot in the Answer Box. This is a very difficult thing to do, but a great way to stand out. Theory states that the top few organic positions get a majority of the clicks. However, it is easy to see that the Knowledge Graph draws a lot of eyes (and clicks) away from that number 1 position, removing a ton of value. 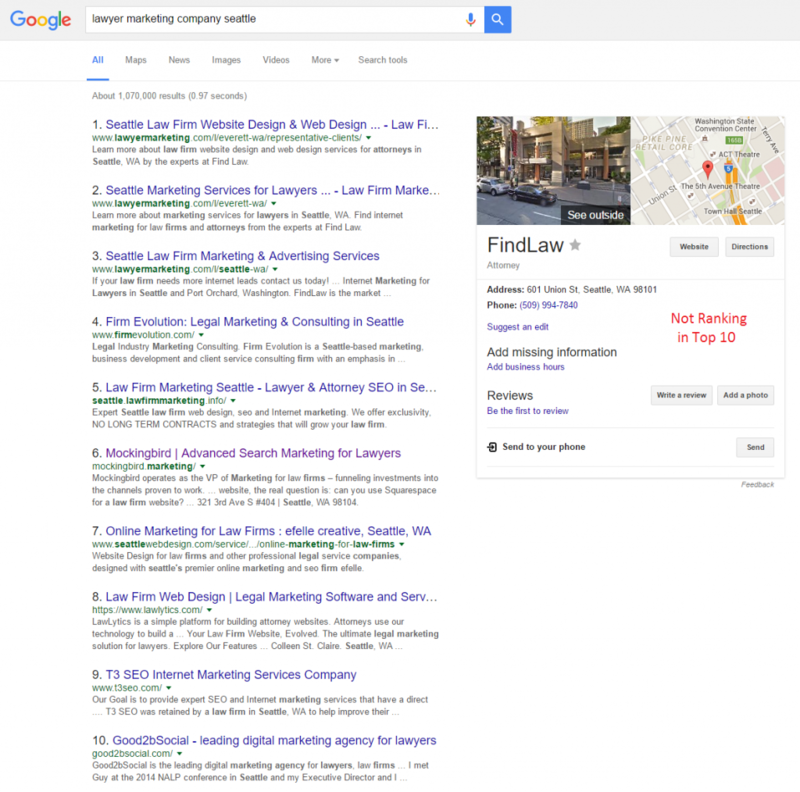 For the search phrase “Lawyer Marketing Company in Seattle,” Mockingbird is obviously the best choice at #6, but Lawyer Marketing is also doing well at #1. FindLaw isn’t even on the first page organically, but their Knowledge Graph gives them a great presence for this search query. 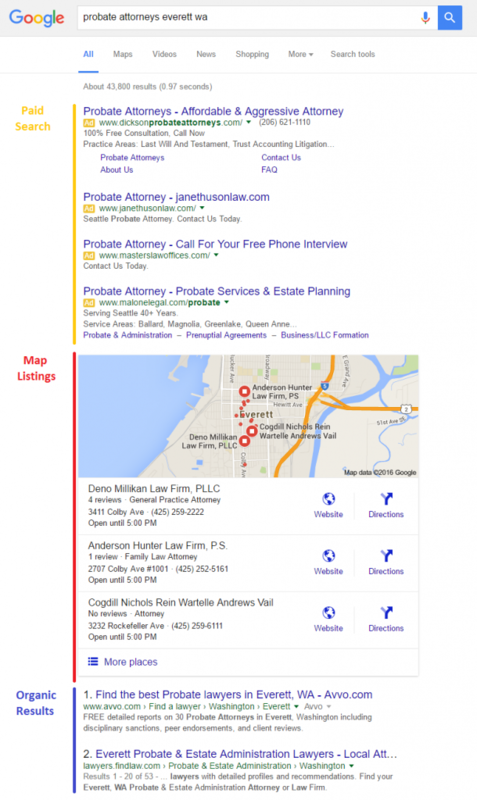 Make sure your law firm has an optimized Google My Business page to try and take advantage of this space. Ranking # 1 isn’t what it used to be. Not only do law firms have to fight for organic position, they have to fight an evolving SERP page with more and more features that pull clicks away from organic results. The best way to battle these additional features is to play the game. Add valuable content to your site that answer your clients most asked questions. Clean up your NAP (name-address-phone number) so Google knows who/where you are. Get reviews so your firm stands on in the Map Pack. Run a variety of paid search campaigns to catch valuable traffic and leads. Most importantly, don’t worry about rankings. Focus on business metrics that provide valuable insights into overall site health. Use traffic, leads, and costs to evaluate your marketing performance. Rankings are worthless unless they drive traffic. Measure what matters. Nate: LawyerMarketing.com is FindLaw. I’m guessing it was a keyworded domain decision back in the day. Also, a counterpoint: what about the difference in CTR by position? Aren’t you going to get a substantially higher CTR (and by extension, traffic) by ranking higher?